LOS BAÑOS, Philippines, February 24, 2017 (ENS) – More than half of the world’s population, nearly four billion people, eat rice as their daily staple, but the changing climate is making it tougher for rice farmers to keep their plants alive until harvest. 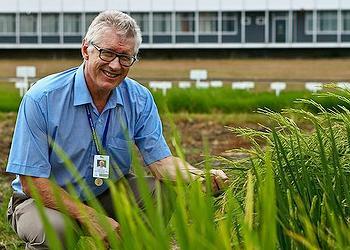 Now, new, stress-tolerant rice varieties can help make farmers more resilient against the increasingly destructive effects of climate change, says Dr. Matthew Morell, director general of the International Rice Research Institute, IRRI, based in the Philippines. Drought, flooding and salt intrusion due to sea level rise are among the most difficult conditions for rice farmers brought on by the warming trend. The planet’s average surface temperature has risen about 1.1 degrees Celsius, or 2.0 degrees Fahrenheit, since the late 19th century, and 2016 was the third year in a row that topped the planet’s heat record. IRRI’s research, conducted in collaboration with national governments, resulted in high-yielding improved varieties that saved Asia from famines in the 1960s and ’70s. As climate change has increased flooding, drought, and soil salinity, IRRI and its partners have responded by developing high-yielding rice varieties tolerant of these environmental stresses. Morell called the climate change-ready rice varieties, which have been deployed in stress-prone areas of India, a critical part of helping farmers become more resilient. Saying rice cultivation supports over 144 million farm families across the world, Dr. Morell emphasized the importance of focusing on disadvantaged areas where it is a challenge to increase yields and improve farmers’ livelihoods. He said the world needs collaborative efforts between institutions in rice research education. Famed Indian geneticist Monkombu Sambasivan Swaminathan, for whom the foundation is named, told the audience, “Apart from productivity and sustainability, small and marginal land holding farmers can greatly benefit from using every part of rice biomass in farming practices. 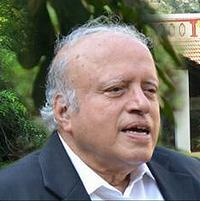 MSSRF has set up a Rice Bio Park in Myanmar that will help utilize every part of the plant,” he said. Drought is the most widespread and damaging of all environmental stresses, affecting 23 million hectares of rainfed rice in South and Southeast Asia. IRRI has developed drought-tolerant varieties, which have been released in several countries and are now being planted by farmers in India, Nepal and the Philippines. Field trials indicate that the average yield advantage of drought-tolerant varieties over drought-susceptible ones is 0.8 to 1.2 tons per hectare under drought conditions. Rice grows in water, but flooding can be nearly as damaging to rice crops as drought. Rice plants normally die within four days of submergence. Farmers in countries with rice areas prone to flooding, such as the Philippines, Bangladesh, and India, lose millions of tons of rice every year due to floods. But IRRI scientists have discovered SUB1, the gene for flood tolerance, and incorporated this gene into popular rice varieties. Field trials of rice varieties with the SUB1 gene have shown a yield advantage of one to three tons per hectare, following flooding of 10–15 days. Flood-tolerant varieties have been released and are now being planted across Asia, in the Philippines, India, Bangladesh, and Indonesia. Millions of hectares of land in Asia and Africa suitable for rice production now are unproductive because of high or increasing salt content in soil. Rising sea levels bring saltwater further inland, contributing to soil salinity. 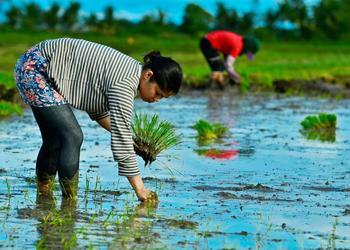 Rice productivity in salt-affected areas is very low, less than 1.5 tons per hectare. To help combat this troublesome problem, a gene for salinity tolerance, called Saltol, has been incorporated into popular rice varieties in countries across Asia. In the Philippines, field trials of Salinas suggest a yield advantage of at least two tons per hectare over non-tolerant varieties. “The interdisciplinary approach adopted by the CLUES Project – encompassing hydrology, plant breeding, crop management and socio-economic approaches – yielded a range of tangible results on future risks stemming from sea level rise as well as possible response strategies in terms of adaptation and mitigation in rice-based systems of the delta,” says Reiner Wassmann, project leader and IRRI coordinator for climate change research. CLUES is part of a global effort to tackle climate change under the CGIAR Research Program on Climate Change, Agriculture and Food Security, jointly implemented by IRRI and Can Tho University, explains Georgina Smith, writing for International Center for Tropical Agriculture, based in Vietnam. “Flooding and sea water intrusion are two of the biggest threats to rice producers in the lower Mekong Delta,” said Dr. Ngo Dang Phong, IRRI’s project coordinator for the CLUES project. 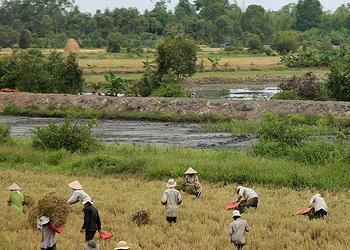 Vietnamese farmers have adapted their farms and water management systems to the environment over the past 30 years. “But recent and forecast agro-hydrological changes, especially salt water intrusion caused by rising sea levels, threaten farming and social systems now more than ever, Phong said. Increasing salt water intrusion affects the operation of sluice gates and dykes and increases river pressure. By 2030, experts believe, salt water could contaminate more than 40 percent of the Mekong River Delta. But rice is a crucial food security crop and export earner in Vietnam, with 6.7 million tons exported in 2013, bringing close to US$2.9 billion into the country, Smith explains. Using a breeding process known as marker assisted backcrossing, researchers have identified favorable traits, such as high-yielding, well-adapted rice varieties, and combined them with other favorable traits to create more robust, elite rice varieties. In this molecular marker-based process there is no need for genetic transformation, so there are no ethical issues as have been raised with transgenic crops. Based on project reports, writes Smith, in total, 36 single and multiple crosses have been made to combine submergence, salinity tolerance, stagnant flood tolerance, and high grain quality into high-yielding genetic backgrounds. 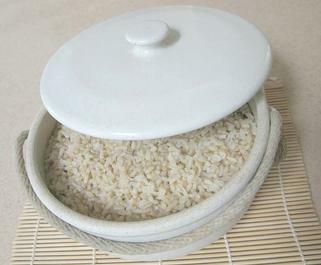 Also, experiments with management techniques have come up with a rice cultivation method that can save water and also reduce emissions of the potent greenhouse gas methane. Known as alternate wetting and drying, this technology involves draining and reflooding of rice fields, keeping just enough water in the soil. This technique reduces water use by up to 30 percent, saving on irrigation-associated fuel and labor costs by about US$120 per hectare in demonstration fields. It can also cut methane emissions by an average of 47 percent compared with continuous flooding rice cultivation.